It is starting to warm up a bit here in Phoenix and while it has been providing nice weather hovering in the mid 70's to mid 80's I am not ready to Let Go of winter yet. Thankfully Disney is providing us a great opportunity to enjoy some icy fun before summer hits. 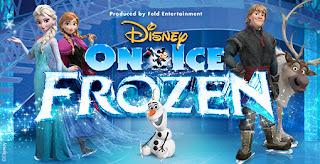 Disney On Ice is coming to the Talking Stick Resort Arena (201 E Jefferson St., Phoenix, AZ 85004) on April 12th @ 7pm ,13th @ 7pm,14th @ 11am, 3PM and 630pm & on the 15th @ 12pm and 4pm. The theme for this leg ...of the Disney On Ice tour is Frozen! Tickets start at $20 and go up from there depending on where in the arena you'd like to sit. You can use Coupon code Blog20 to receive 20% off your ticket, It is valid for up to eight tickets. It is not valid on VIP tickets or on opening night. Tickets available for purchase online at Ticketmaster.com, charge by phone at 800-745-3000 or visit the venue Box Office. I am looking into tickets now! We are big on Disney at our house.